When it comes to understanding people, internet searches say a lot. By analyzing what people in different parts of the country search in Google, we can learn an extraordinary amount of information about their lives. We can understand everything from their most fleeting interests to their most significant health challenges. And, in the case of health challenges, one of the ways we can tell what people are concerned about, is by analyzing what pharmaceutical drugs they search for. In the study below, we’ve analyzed search data related to the top 50 best-selling branded drugs in the United States. After gathering the raw data, we established average national search volumes for each of the top 50 drugs, then looked at data from each state to see which populations are searching for which drugs more than average. Even if you’re not a pharmacy technician, the results are fascinating. The drug that was searched at higher rates in more states than any other drug, was Subuxone. Suboxone, which is used to help addicts, is similar to methadone, the drug that’s been used to help heroin addicts kick their habits for several decades. Fourteen different states had Suboxone as their most searched drug, compared against the national average. Included in that list: Washington, Alaska, Colorado, Michigan, Massachusetts, Ohio and Kentucky. Also related to addiction, Chantix, a smoking cessation aid, was the top searched drug in Montana, Wyoming, North Dakota and Iowa. 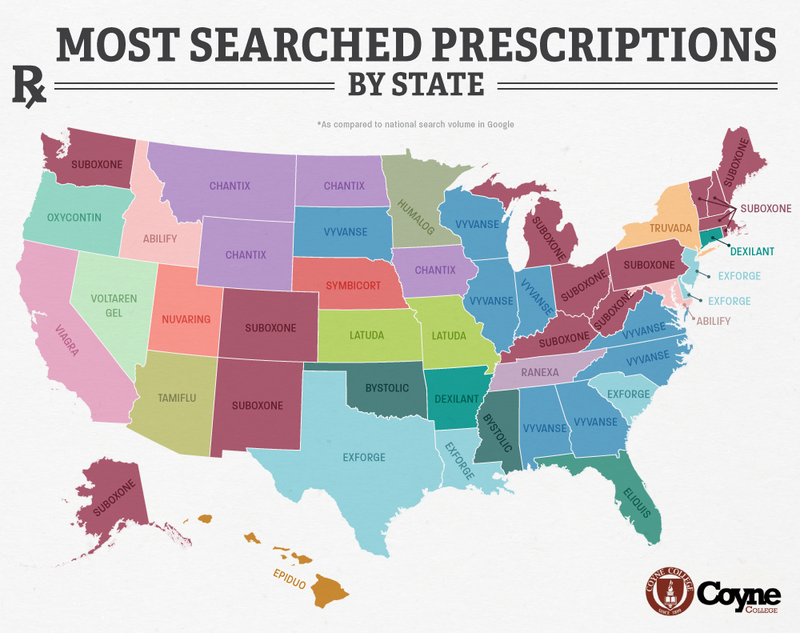 The largest state in our union (by population) scored high for Viagra searches, while the second largest state, Texas, scored high for Exforge searches. Viagra is a drug used to treat erectile dysfunction, and Exforge is for high blood pressure and hypertension. Louisiana also scored high for Exforge searches. Two antipsychotics appeared on the most searched list, both used to treat schizophrenia, bipolar disorder and depression. Missouri and Kansas inquired most about Latuda, while Idaho inquired most about Abilify. Utah was the only state in the country that scored high for searches inquiring about Nuvaring, an implant-based birth control method. Similarly, Truvada, an important HIV antiviral, showed up in just one state as the most frequently searched drug—that state is New York. After Suboxone, Vyvanse is the next most frequently appearing drug on our list, ranking as the top searched drug in seven states: South Dakota, Wisconsin, Indiana, North Carolina, Virginia, Alabama, and Georgia. Vyvanse is a stimulant used to treat ADHD and binge-eating disorder. What about your state? Do you have any theories for why a certain drug is searched there more than the national average?